Think you can recognize anything at Disneyland at 100 toon-paces? Now's your chance to find out just how good you are! That's Not At Disneyland! 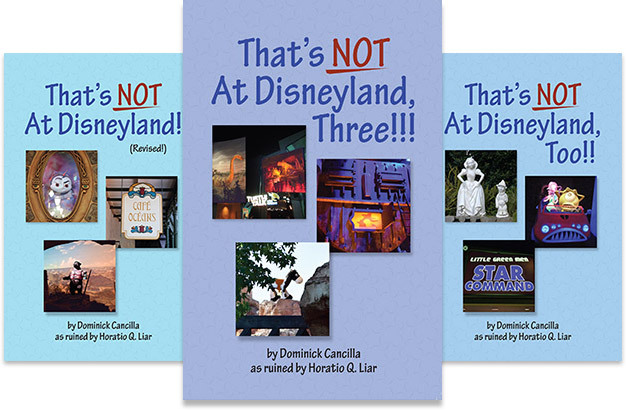 is a seeries of puzzle books for the true Disneyland superfan. The books are filled with photographs of things at Disneyland that have been subtly (or, in some cases, not at all subtly) changed. Can you spot the inaccuracies and remember what really should be there? After you've had time to think it over, turn the page to see the real photo, or check the answers in the back of the book if you're still unsure. How did you do? If you did well, contratulations! If you didn't do so well, remember what you missed and then make fun of your friends when they don't notice it either! That's Not At Disneyland, Too!! That's Not At Disneyland, Three!!! 396 Pure, Unadulterated, Dyed-In-The-Wool, 100% Made-Up, Completely Fake Disneyland "Facts".